john4jack (Corvallis, Oregon, United States) on 26 September 2009 in Sport & Recreation and Portfolio. YESTERDAY'S SHOT - Barbara suggested that yesterday's shot might look better with the bottom cropped; so I did. You might want to go back and take a look. ON COMMENTING - I feel like I now belong to a Blogwatch subcommunity of the larger Am3 community. One of my goals is to make comments based upon what seem to be the goals of the photographer (rather than what would be my goals). I want to be supportive of people achieving their own particular objectives. Oh......this is my favorite so far! The blue sky against all of these vivid colors. Just amazing! @Tammy-Cricket: Thank you. It was a gorgeous morning. A very nice moment when taking off. Great colors! THIS is a Spotlight for SURE ! Woooooow-wow ! I lost my words = magical shot that embraces us in its light and crazy gorgeous frame ! Great shot Jack, an outstanding collection of harmonious colors. A magnificent composition and amazing light & colors. Love your serie Jack !! Stunning vibrant colors. I love the intensity. Of course I'm blown away with being so up close especially as there is lift off. It appears there is a passenger in there hanging on very tight. The shadow of the basket and balloon on the neighboring balloon is priceless. I think I might like to give this a try. Nicely framed. Wow! awesome shot! I love all the beautiful colors! @Tracy: It doesn't cry out for B&W, does it?? The color is stunning! Fine composition and nice "catch" time wise today. A beautiful shot. great compo and colors ! a wonderful series ! Great composition and height that you have achieved in this photo! The hot air balloon that is on its way up takes on a three-dimensional view against the sky. @MJ: The crop was of Air Show 3 and the result of the crop is what you now see on Air Show 3. Today's shot is a totally separate shot. Bravo ce cadrage est vraiment top et les couleurs me plaisent beaucoup. Super shot . Colors are fabulous ! looks like a fun location. I've always wanted to shoot something like this, the colors against a blue sky are incredible! Great light. @Don Smith: Thanks, Don. That early morning light was wonderful. Another stunner! Just perfect again! A very nice sery, love theese colors, all is red in your afternoon !! We have lift off. How absolutely cool. Simply superb, worth five stars again. what a gorgeous day you had for taking these shots....and your processing is really pulling out all the punches....Great job!!! The light is amazing and so are the colors! And I totally agree with your comment on commenting. Thank you for saying it. Wonderful image and work on this! I like the red against the blue in the sky! @Scott F. Schilling: Thanks, Scott. Oh my gosh! This is fabulous! I certainly hope you made spotlight with this one Jack! Wow - what a fantastic series. What a beautiful morning. I'll bet the view from up above was just as gorgeous. Great series, Jack. @Lesley: For those who got off first (about 6:30 a.m.), the early morning light had to be spectacular. I am amazed by the sky, as well at the rest... Incredibly captured, Jack. just superb ! vivid colors and wonderful lighting ! I love the compo with the only one above the others ! The colors are so vibrant and the details are amazing. 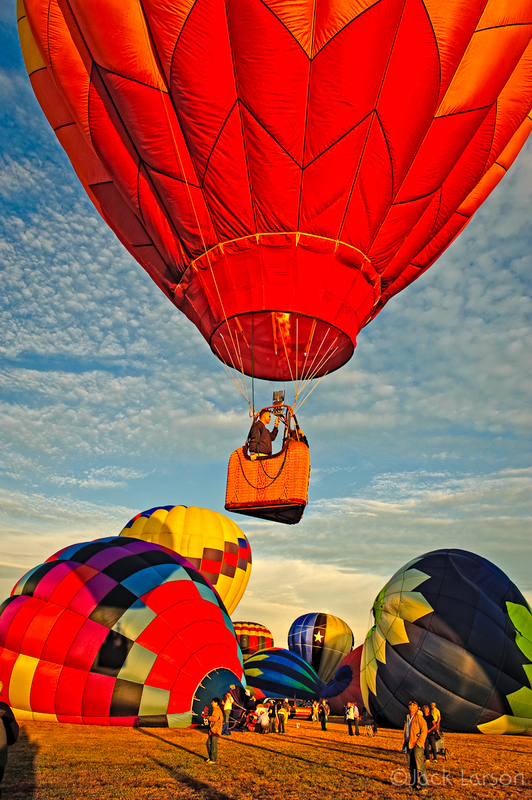 I'm in awe of all of these hot air balloon shots! Great composition. I can feel the heat from the burner and hear its roar. Great work.